This two story Townhome is perfect for a multifamily vacation or romantic couples' getaway. The home entry is ground level, end unit w/ bright windows & wonderful private courtyard.100 steps to the beach. Leave the stresses & strains of work life behind. This is where memories are made, in this Magnificent Ocean Front 3 bdrm/2 bath unit at the Pinnacle. Located in the beautiful Crescent Beach section of North Myrtle. This 9th floor unit will not disappoint, it will be the highlight of your vacation! Awesome view of the ocean with beach activities right out front! This 4BR / 3BA ocean front condo sleeps 12. Located in the South tower, walking distance to restaurant, beach store & mini-golf. This 8th floor gem will give you hours of seaside daydreaming. Enjoy your vacation in this luxurious, spacious condo. Experience the sunrise from this 15th floor end unit. Oceanfront balcony offers expansive views of the beach from the master bedroom and living room. 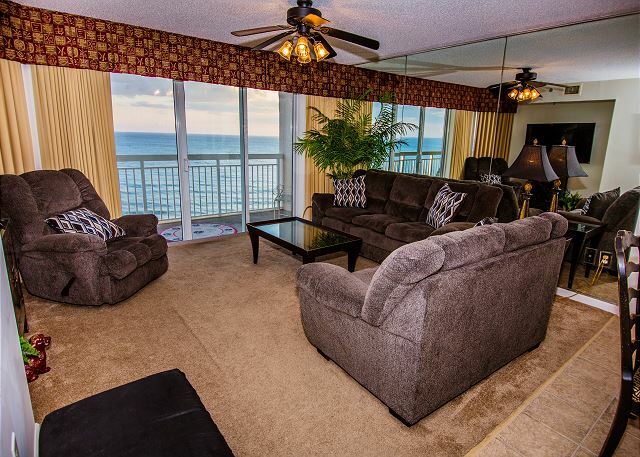 This beautiful oceanfront condo is located at the very popular Crescent Shores resort. A rare 4BR/4BA on the 17th floor in the North Tower with amazing views of the Atlantic Ocean. Access to the furnished balcony is from the living room or master bedroom.